Copyright: © 2015 Chung H. This is an open-access article distributed under the terms of the Creative Commons Attribution License, which permits unrestricted use, distribution, and reproduction in any medium, provided the original author and source are credited. Alzheimer's disease (AD) is a neurodegenerative disorder associated with the loss of neurons that are vital for memory and other cognitive functions . Current treatments have limited benefits and with the number of affected people expected to quadruple by 2050, effective therapies are required. Our current understanding of AD comes from diverse sources including neuronal cell lines [2-5], transgenic rodent models [6,7] and primary neuronal cell cultures derived from them . However, candidate proteins known to be involved in the disease pathology may exhibit species-specific biochemical and functional characteristics, thereby providing only an imperfect human representation. Therefore it is important to develop alternative models that correctly recapitulate the complex pattern of proteins in human AD. Pluripotent stem cells may be good 'disease models' because of their unique capacity to differentiate and self-renew and their developmental representation of early stages of life. Generation of disease-specific human embryonic stem cell (hESC) lines from pre-implantation genetic diagnosed (PGD) embryos is limited by their availability. The genetic engineering of existing hESC lines is also possible but these present technical difficulties. The recent production of induced pluripotent stem cells (iPSCs) offers a potential solution as these cells can be produced from patient skin with a simple transduction of four genes (OCT4, KLF4, SOX2, CMYC) . Diseased-specific iPSCs have been generated for several disorders including Spinal muscular atrophy, Long-QT syndrome and Huntington's disease as reviewed by Sidhu , all of which demonstrated genetic and phenotypic differences in the relevant differentiated cell type(s) when compared to control healthy iPSCs derived from un/related individuals. These and other recent developments in sporadic cases of Alzheimer's disease [11,12] provide unprecedented advantages for drug discovery and providing further insight into disease etiology. AD is generally diagnosed by cognitive impairment/dysfunction and functional impairment, with an increasing emphasis on biomarkers, and ultimately through histological analysis of post mortem brains. Most patients with AD have a late-onset sporadic form of the disease. Environmental factors, vascular risk factors, presence of Apolipoprotein ε4 (APOE4) allele, and some other genetic polymorphisms all greatly increase a person's susceptibility to sporadic AD, as reviewed by Taupin . In the present study we have generated AD-iPSC clones from a sporadic female AD patient with strong clinical symptoms and performed a genome-wide transcriptome analysis with control pluripotent cells. Interestingly, several potential biomarkers implicated in memory impairment and AD were differentially expressed. This suggests that AD-iPSCs may provide an alternative in vitro model to study the underlying mechanisms of AD. This study was conducted in accordance with the University of New South Wales (UNSW), Human Research Ethics Committee (HREC) approvals (HREC # 08037). Human dermal fibroblasts were isolated from a punch skin biopsy from the female patient clinically diagnosed sporadic case of Alzheimer's disease with APOE α4/4. Fibroblasts were cultured in DMEM media supplemented with 10% FBS, Penicillin/streptomycin and Glutamax for 2-3 weeks. At passage 2-5, 100,000 fibroblasts were transduced with a polycistronic lentiviral vector encoding for genes; OCT4, KLF4, SOX2, CMYC under a constitutive promoter . At day 5, transduced cells were harvested and seeded onto irradiated human fetal fibroblast feeder layers in hESC maintenance media (KO-DMEM supplemented with 20% SR, Glutamax, Penicillin/streptomycin, non-essential amino acids, Insulin transferrin selenium, β-mecaptoethanol). Daily media changes were performed using hESC maintenance media supplemented with 10 ng/ml bFGF. Control iPSCs were derived in a similar fashion using human fetal fibroblasts. Control (Co-) and AD-iPSCs were later transferred to a feeder-free system using hESC-qualified MatrigeTM(BD Biosciences) coated plates and mTeSRTM1 media (StemCell Technologies), according to manufacturer's protocol. All reagents were purchased from Life Technologies unless otherwise stated. Neuroprogenitor differentiation was carried out following  slight modifications to Zhang's et al. protocol . Briefly, confluent wells of pluripotent stem cells were subjected to 1 mg/ml dispase treatment for 20-30 min at 37 °C (or until intact colonies 'lifted' off) and further cultured for 4 days in mTeSRTM1 media in low adherent culture plates. Spherical aggregates were cultured for a further 3 days in neural induction media (DMEM/F12 supplemented with N2 (1%), non-essential amino acids and heparin). Aggregates were then transferred to laminin-coated (~20 μg/ml) plates for a further 8 days. Partial media changes were performed every other day. Neural rosette-like structures were observed at the end of 15 days induction and subjected to 1 mg/ml dispase treatment for 5-10 min. Gentle trituration allowed the dislodgement of the rosette-like structures and the cell suspension was transferred to low adherent culture plates in neural maintenance media (neural induction media supplemented with B27 (1%) and 20 ng/ml bFGF). After overnight culture, floating aggregates were transferred to a new well, hence selecting out the attached neuroepithelial cells. Floating aggregates were propagated as neurospheres and were passaged on a 2-3 weekly basis by mechanical dissociation. Partial media changes were performed every other day. 100 ng of total RNA from hESCs and iPSCs were labeled and hybridized onto Affymetrix Human GeneChip® Gene 1.0 ST arrays (Santa Clara, USA) according to the manufacturer's instructions at the Ramaciotti Centre for Genomics (UNSW, Australia). RMA normalized data  was subjected to one-way ANOVA to look for differential gene expression between cell lines (Partek Genome Suite v6.5). A False Discovery Rate (FDR) of 0.05 was used. Candidate genes were functionally annotated according to Gene Ontology (GO) terms . Hierarchical clustering was carried out to look for possible co-regulation of significant differentially expressed candidate genes based on Euclidean and complete linkage distances using MeV 4.6.2 . Further analysis to highlight Alzheimer's disease related genes was carried out by obtaining the gene list from SABiosciences-curated pathways (Maryland, USA). Total RNA was extracted using TRIzol® and 1 μg was reverse transcribed to cDNA using SuperScript® III kit with random hexamers. Genes of interest were quantitatively detected using SsoFast™ EvaGreen® supermix (BioRad) and relative expression calculated using Pfaffl's methods . All reagents were purchased from Life Technologies following manufacturer's instructions unless stated otherwise. Biological triplicates were used. Cell samples were fixed in 4% paraformaldehyde (Sigma-Aldrich) for 20 min, permeablized with 0.1% Triton X-100/PBS for 10 min and blocked with 2% BSA/PBS for 1 h. Cell samples were stained with appropriate primary antibodies in blocking solution overnight at 4 °C and AlexoFluor® conjugated secondary antibodies (Life Technologies) for 30 min at room temperature. Cells were counterstained with DAPI (Life Technologies). Primary antibodies: SOX17 (R&D Systems), OCT4, NANOG, SSEA4, TRA160 and SMA (Abcam), βIII tubulin (Covance), NESTIN (Millipore), PAX6 and SOX1 (Santa Cruz). Using our previously optimized procedure  two iPSC clones were established and designated as Alzheimer's disease-specific lines, i.e. ALZ1 and ALZ7, and these were subcultured on a 5-7 day basis using TrypLE Select for 5-10 passages before being transferred to a feeder-free system consisting of MatrigelTM coated plates and mTeSRTM1 medium . Colonies of AD-iPSCs were morphologically indistinguishable from control (Co) iPSC and hESCs (Figure 1A). Further characterization revealed that AD-iPSCs were genetically and phenotypically indistinguishable from control hESC/hiPSCs. Hypomethylated OCT4 promoter regions indicated successful reprogramming of fibroblasts (24.4% vs. 66.7%, Figure 1B). 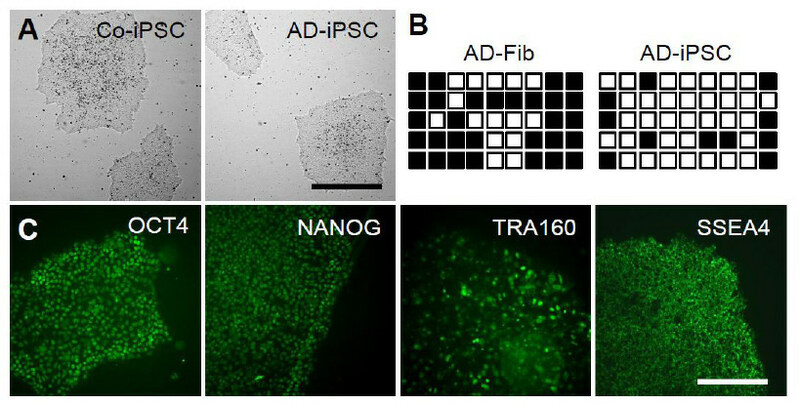 Using immunofluorescence staining, feeder-free cultures of AD-iPSCs typically expressed undifferentiated pluripotent markers OCT4, NANOG, SSEA4 and TRA160 (Figure 1C). Quantitative gene expression analyses of pluripotency-associated genes were not significantly different across pluripotent cell lines. In contrast, parental fibroblasts (AD-Fib) expressed extremely low levels of NANOG, OCT4, SOX2 and GDF3, but had similar levels of CMYC and KLF4 expression (Figure 1D). Furthermore, extended feeder-free culture showed no chromosomal abnormalities in ALZ1/ALZ7 as determined by standard G-banding karyotypic analysis (Figure 1E). Pluripotency of AD-iPSCs was examined through in vitro embryoid body formation and in vivo teratoma formation assays. Cells and tissue structures generated were representative of the three embryonic germ layers, respectively (Figure 2A-C). 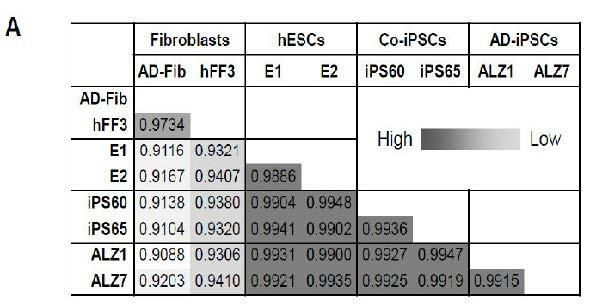 DNA fingerprinting analysis confirmed the genetic identity of AD-iPSCs as being derived from AD-Fib and not from cross-contamination with other cell lines ( Figure S1). 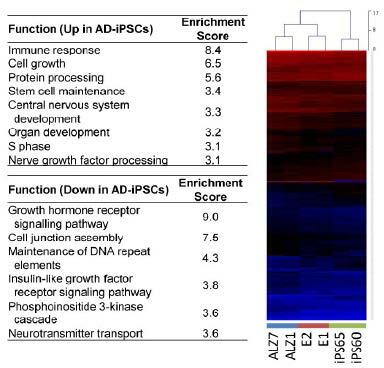 The transcriptome of AD-iPSCs was similar to Co-iPSCs and hESCs, as determined by whole-genome transcript analysis using Affymetrix Human Gene 1.0 ST arrays. 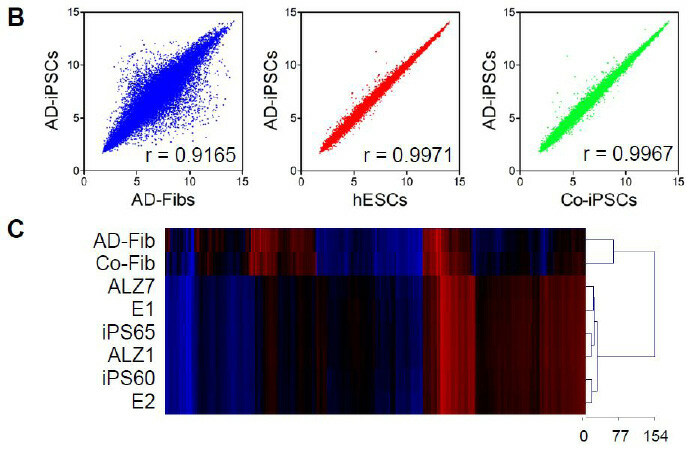 Scatterplots and correlation coefficients revealed that on the 33,297 transcripts, ADiPSCs, Co-iPSCs and hESCs were highly correlated with each other whereas minimal correlation was observed between fibroblasts and pluripotent cells (Figure S2A-B). A heat map was generated based on 4,532 genes that were differentially expressed (False discovery rate (FDR)-corrected P value < 0.05 and fold change > ±2), between fibroblast and pluripotent cell populations (Figure S2C). Overall, this indicated that AD-iPSCs were highly similar to Co-iPSCs and hESCs in terms of global gene expression. We further analyzed the expression of four of these genes using quantitative RT-PCR (qRT-PCR) (Figure 3C). Surprisingly, these genes were not significantly different from each control (E2, iPS65) or diseased (ALZ1, ALZ7) cell lines, which is in contrast to the microarray data. In fact, both NAIP and SNORD116-18 were observed to have an opposite trend in gene expression. This was most probably due to the design of the primers used in qRT-PCR, which targeted multiple regions of NAIP (i.e. chr5:69404269-69404333, chr5:70279736-70279800 and chr5:70404622-70404686 on chromosome 5q13.2) and multiple 61 bp regions of the SNORD116 gene cluster (chr15:25327944-25328004, chr15:25328764-25328824, chr15:25330561-25330621, chr15:25331703-25331763, chr15:25332838-25332898, chr15:25333980-25334040, chr15:25335099-25335159 on chromosome 15q11-13). Furthermore, well characterized familial AD-associated genes (APP, PSEN1, PSEN2) [23,24] and non-familial (A2M, APOE, GAP43, MAOA, MPO, PLAT, PLAU, SORL1, SNCA) [13,25-27], exhibited different expression patterns, as determined by the microarrays but were largely reset upon reprogramming into a pluripotent state (Figure S4). We next examined whether AD-iPSCs could develop into neuronal lineages by following a slightly modified neural induction protocol . By day 10 of neural induction, PAX6+ and SOX1+ cells were apparent among the attached clusters (data not shown). We were able to generate neurospheres in hESC, Co-iPSC and AD-iPSC populations through mechanical dissociation of neural rosettes formed at the end of a 15 day induction period (Figure 4A). 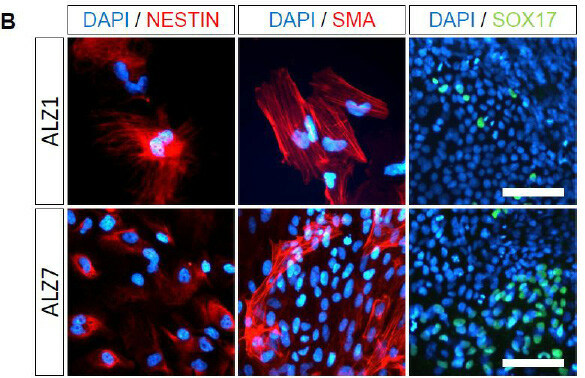 Immunofluorescence analysis indicated that neuroprogenitors derived from control and disease cell lines stained positive for NESTIN, PAX6 and SOX1 (Figure 4B). Gene expression analysis indicated that NESTIN and SOX2 were minimally upregulated (< 10 fold), whereas PAX6 and SOX1 expression were upregulated up to ~10,000 fold (Figure 5A). NANOG was significantly downregulated in all neuroprogenitor lines as expected (P < 10-6) and was not significantly different between cell lines. Interestingly, only E2-neuroprogenitors exhibited statistically significant upregulated gene expression values in all neuronal genetic markers analyzed (P < 0.05), indicating that hESC differentiation protocols were more reproducible, whereas hiPSC differentiation were more variable (i.e. ranging between 100 to 10,000 fold). Overall, both protein expression and gene expression profiling in control and disease hiPSCs of neuronal markers (i.e. NESTIN, PAX6, SOX1, SOX2) indicated no significant differences in neuroprogenitor formation (Figure 5A-C). Neuroprogenitors or neural stem cells offer the potential to self-renew and differentiate into multiple neural/glial lineages. Therefore, we investigated the proliferation rate of AD-iPSC derived neuroprogenitors using 5-ethynyl-2´-deoxyuridine (EdU) incorporation assays. Interestingly, a significantly lower percentage of EdU+ cells were found in ALZ7-neuroprogenitors but not ALZ1-neuroprogenitors compared with control cells (Figure 4C, 5B). We next investigated whether this lower proliferation rate was due to an increase in apoptosis. Therefore we examined the expression of several key apoptosis-related genes. 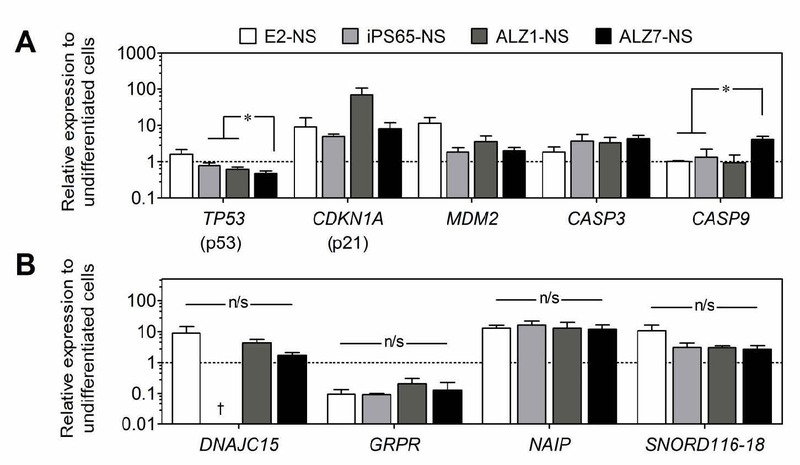 Amongst, CASP3, CASP9, CDKN1A (p21), MDM2 and TP53 (p53), only TP53 and CAPS9 genes were significantly different with control and ALZ1 derived neuroprogenitors (Figure 6A). 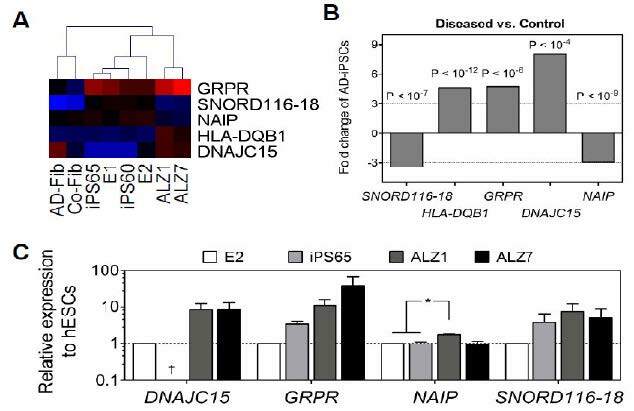 Furthermore, the 4 candidate genes DNAJC15, GRPR, NAIP and SNORD116-18 isolated as being specific to AD-iPSCs, were also analyzed at the neuroprogenitor stages. Interestingly, none of the neuroprogenitor cell lines exhibited significant differences in gene expression (Figure 6B). Human iPSCs have been generated for many degenerative diseases, some of which displayed abnormal phenotypes following directed differentiation [28,29], while some were physiologically functional [30,31]. In the present study, we generated hiPSCs from a female sporadic AD patient and these cells were phenotypically indistinguishable from undifferentiated control hiPSCs and hESCs. Although global transcriptomic analysis revealed high similarity between disease and control pluripotent cells, there were a small number of genes that were differentially regulated, some of which have been implicated in neurological disorders. Although neuronal apoptosis inhibitory protein (NAIP) was ~3 fold lower in AD-iPSCs than Co-iPSCs/hESCs (as determined by microarray analysis), qRT-PCR detected an equal amount of NAIP transcript in all undifferentiated cell lines. This was probably due to the design of the oligonucleotide primers which we later confirmed to amplify 2 other regions on the NAIP transcript. As the name suggests, NAIP is an anti-apoptotic protein and has been implicated in motor neuron apoptosis in spinal muscular atrophy . Individuals with Down syndrome also exhibit decreased expression of NAIP in their cortex , and they are genetically predisposed to AD. Furthermore, NAIP is inversely related to paired helical filament-1 protein in brain tissue of AD individuals , which may indicate the presence of NFT pathology in non-familial AD-iPSCs. Gastrin releasing peptide receptor (GRPR) is a G-protein coupled receptor and has been extensively studied in cancers  and expressed in multiple regions of the central nervous system, including the hippocampus , a region important for episodic memory. It is increasingly evident that GRPR is associated with several neurological disorders, including AD, as reviewed in Roesler et al. . The higher expression of GRPR in AD-iPSCs compared with their undifferentiated counterparts (~3 fold and ~10 fold in microarray and qPCR analysis, respectively), could arguably be due to an additional transcript copy on the X chromosome. However, since female hiPSC lines have been shown to retain their inactive X chromosome even after reprogramming into a pluripotent state , high GRPR levels may in fact be associated with AD. Furthermore, the increased expression may suggest susceptibility of receptor activation and subsequent long-term memory impairment , leading to AD-associated memory loss. DNAJC15 (also known as MCJ, DNAJD1) is normally silenced in the majority of carcinoma cell lines via DNA hypermethylation and loss of DNAJC15 causes resistance to chemotherapeutic agents in vitro [39,40]. Co-Fib readily expressed DNAJC15, but it was absent from Co-iPSCs and its neuroprogenitor derivatives. Extensive epigenetic remodeling takes place during somatic cell reprogramming [41,42], and the presence of multiple H3K27Ac regions (Histone 3 Lysine 27 acetylation, http://genome.ucsc.edu), within the DNAJC15 transcript indicates repressive (and also stable) epigenomic modification(s) to that particular genomic region, leading to gene silencing. Surprisingly, E1 but not E2 cell lines also exhibited this phenomenon. Therefore fetal derived hiPSCs (i.e. Co-iPSCs) may be more resistant to drug evaluations and subsequently may not be suitable candidates for high throughput screening (HTS) for drug discovery and/or toxicology studies. Small nucleolar RNA, C/D box 116 (SNORD116) is a non-coding RNA region that resides in the SNRPN transcript and contains 29 tandem repeated copies of the SNORD116 gene (1-29, http://genome.ucsc.edu). Measuring SNORD116-18 was difficult since the qPCR primers targeted multiple regions within SNORD116 and subsequently contradicted results from the microarray analysis. Though results were inconclusive, SNORD116 was reportedly expressed at low levels in hiPSCs derived from Prader-Willi syndrome patients – a neurological disorder caused by gene deletions . This indicates a possible link between AD and Prader-Willi syndrome. Whether SNORD116-18 is involved with neurological diseases or bears a consequence of somatic cellular reprogramming, remains to be defined. Control and disease cells could differentiate into neuroprogenitors, however variable gene expression patterns were observed in our hiPSC-derived neuroprogenitors, which were similar to other differentiation protocols [44-46]. This suggests that although hiPSCs can differentiate into multiple cell types like hESCs, their differential variability between cell lines (or in our case, within the same cell line) is statistically more prominent. Interestingly, one of the AD-iPSC-derived neuroprogenitor lines (i.e. 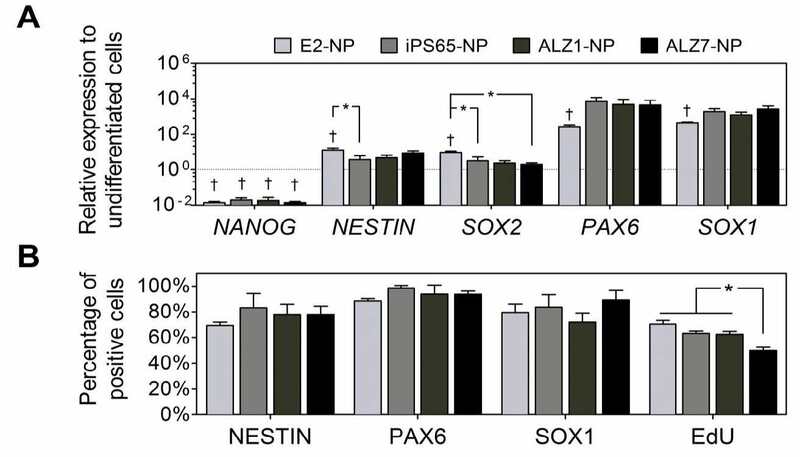 ALZ7) exhibited a significantly lower proliferation rate when compared with other neuroprogenitor lines. With further analysis, we observed atypical TP53 and CASP9 gene expression, which was indicative of apoptosis. This may suggest potential apoptotic mechanism(s) are involved in the intermediate stages of AD, in addition to the ones reviewed by Crews and Masliah . This would subsequently compromise neuronal development, correlating to individuals diagnosed with early onset non-familial AD. Additionally, candidate genes we classified to be specific to sporadic AD based on differential expression (i.e. DNAJC15, GRPR, NAIP, SNORD116-18) were not significantly different between neuroprogenitor lines. Overall, differentiation of disease-specific hiPSCs into progenitor cell types was not significantly different to controls, and this was observed in several other studies [10,48]. Whether specific neuronal deficits or abnormal expression of our analyzed genes/proteins appear at a more terminal cell derivative (e.g. basal forebrain cholinergic neurons, glial) remains to be determined. We have until now defined disease-specific hiPSCs based on the patient who donated the skin. For monogenic disorders, this is simple to characterize, but for complex diseases such as sporadic Alzheimer's, the disease specificity is defined by both patient phenotype and genotype, as with this study. Furthermore, environmental stressors and epigenetic influences also contribute to the difficulties in replicating faithfully in an in vitro model. Another limiting factor in the present study was the lack of an appropriate hiPSC control cell line. The ideal scenario would be to have unaffected sib-pair that can act as an internal control due to similar genetic background. To adequately study the pathophysiology of AD, multiple AD-iPSCs should be derived from patients with various clinical symptoms in order to reflect early/late onset and/or familial/sporadic versions of the disease. We believe that the AD-iPSCs generated in this study is a representative disease-specific cell line, which will be an invaluable in vitro model to study the molecular mechanisms in AD and subsequently, for high throughput screening. However, before such application, it will be useful to further differentiate AD-iPSCs into mature neurons, such as cholinergic lineages of the basal forebrain as described elsewhere [15,49] to determine whether there is impairment during neuronal development. Because the two AD-iPSC lines exhibited contradicting outcomes, it is recommended that future disease modeling studies using hiPSCs should attempt to analyze three or more cell lines from any individual for accurate conclusions. 1 Caselli RJ, Beach TG, Yaari R, Reiman EM (2006) Alzheimer's disease a century later. J Clin Psychiatry 67: 1784-800. 2Neill D, Hughes D, Edwardson JA, Rima BK, Allsop D (1994) Human IMR-32 neuroblastoma cells as a model cell line in Alzheimer's disease research. J Neurosci Res 39: 482-93. 3Trimmer PA, Swerdlow RH, Parks JK, Keeney P, Bennett JP, et al. (2000) Abnormal mitochondrial morphology in sporadic Parkinson's and Alzheimer's disease cybrid cell lines. Exp Neurol 162: 37-50. 4Zhang Z, Drzewiecki GJ, Hom JT, May PC, Hyslop PA (1994) Human cortical neuronal (HCN) cell lines: a model for amyloid beta neurotoxicity. Neurosci Lett 177: 162-4. 5 Shaughnessy L, Chamblin B, McMahon L, Nair A, Thomas MB, et al. (2004) Novel approaches to models of Alzheimer's disease pathology for drug screening and development. J Mol Neurosci 24: 23-32. 6 Oddo S, Caccamo A, Shepherd JD, Murphy MP, Golde TE, et al. (2003) Triple-transgenic model of Alzheimer's disease with plaques and tangles: intracellular Abeta and synaptic dysfunction. Neuron 39: 409-21. 7 Tanzi RE (1995) A promising animal model of Alzheimer's disease. N Engl J Med 33: 1512-3. 8Qiu Z, Naten DL, Liston JC, Yess J, Rebeck GW (2001) A novel approach for studying endogenous abeta processing using cultured primary neurons isolated from APP transgenic mice. Exp Neurol 170: 186-94. 9 Takahashi K, Tanabe K, Ohnuki M, Narita M, Ichisaka T, et al. (2007) Induction of pluripotent stem cells from adult human fibroblasts by defined factors. Cell 131: 861-72. 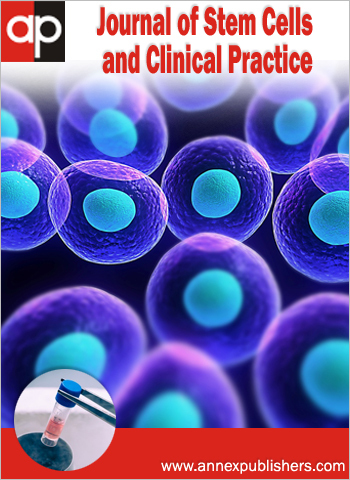 10 Sidhu KS (2011) New approaches for the generation of induced pluripotent stem cells. Expert Opin Biol Ther 11: 569-79. 11Hossini AM, Megges M, Prigione A, Lichtner B, Toliat MR, et al. (2015) Induced pluripotent stem cell-derived neuronal cells from a sporadic Alzheimer's disease donor as a model for investigating AD-associated gene regulatory networks. BMC Genomics 16: 84. 12Zhu XC, Tan L, Wang HF, Jiang T, Cao L, et al. (2015) Rate of early onset Alzheimer's disease: a systematic review and meta-analysis. Ann Transl Med 3: 38. 13Taupin P (2009) Adult neurogenesis, neural stem cells and Alzheimer's disease: developments, limitations, problems and promises. Curr Alzheimer Res 6: 461-70. 14 Chung HC, Lin RC, Logan GJ, Alexander IE, Sachdev PS, et al. (2012) Human induced pluripotent stem cells derived under feeder-free conditions display unique cell cycle and DNA replication gene profiles. Stem Cells Dev 21: 206-16. 15Lie, KH, Chung H, Sidhu KS (2012) Derivation, propagation and characterisation of neuroprogenitors from pluripotent stem cells (hESCs and hiPSCs) in Human Embryonic Stem Cells Handbook, Kursad Turksen Methods Mol Biol 873: 237-46. 16Zhang XQ, Zhang SC (2010) Differentiation of neural precursors and dopaminergic neurons from human embryonic stem cells. Methods Mol Biol 584: 355-66. 17Lin RC, Weeks KL, Gao XM, Williams RB, Bernardo BC, et al. (2010) PI3K (p110 alpha) protects against myocardial infarction-induced heart failure: identification of PI3K-regulated miRNA and mRNA. Arterioscler Thromb Vasc Biol 30: 724-32. 18 Ashburner M, Ball CA, Blake JA, Botstein D, Butler H, et al. (2000) Gene ontology: tool for the unification of biology. The Gene Ontology Consortium. Nat Genet 25: 25-9. 19 Saeed AI, Bhagabati NK, Braisted JC, Liang W, Sharov V, et al. (2006) TM4 microarray software suite. Methods Enzymol 411: 134-93. 20Pfaffl MW (2001) A new mathematical model for relative quantification in real-time RT-PCR. Nucleic Acids Res 29: e45. 21Ludwig TE, Bergendahl V, Levenstein ME, Yu J, Probasco MD, et al. (2006) Feeder-independent culture of human embryonic stem cells. Nat Methods 3: 637-46. 22 Roesler R, Henriques JA, Schwartsmann G (2006) Gastrin-releasing peptide receptor as a molecular target for psychiatric and neurological disorders. CNS Neurol Disord Drug Targets 5: 197-204. 23 Games D, Adams D, Alessandrini R, Barbour R, Berthelette P, et al. (1995) Alzheimer-type neuropathology in transgenic mice overexpressing V717F betaamyloid precursor protein. Nature 373: 523-7. 24Shen J, Bronson RT, Chen DF, Xia W, Selkoe DJ, et al. (1997) Skeletal and CNS defects in Presenilin-1-deficient mice. Cell 89: 629-39. 25Saunders AM, Strittmatter WJ, Schmechel D, George-Hyslop PH, Pericak-Vance MA, et al. (1993) Association of apolipoprotein E allele epsilon 4 with lateonset familial and sporadic Alzheimer's disease. Neurology 43: 1467-72. 26Rogaeva E, Meng Y, Lee JH, Gu Y, Kawarai T, et al. (2007) The neuronal sortilin-related receptor SORL1 is genetically associated with Alzheimer disease. Nat Genet 39: 168-77. 27Ashford JW, Mortimer JA (2002) Non-familial Alzheimer's disease is mainly due to genetic factors. J Alzheimers Dis 4: 169-77. 28Carvajal-Vergara X, Sevilla A, D'Souza SL, Ang YS, Schaniel C, et al. (2010) Patient-specific induced pluripotent stem-cell-derived models of LEOPARD syndrome. Nature 465: 808-12. 29 Marchetto MCN, Carromeu C, Acab A, Yu D, Yeo GW, et al. (2010) A model for neural development and treatment of Rett syndrome using human induced pluripotent stem cells. Cell 143: 527-39. 30Soldner F, Hockemeyer D, Beard C, Gao Q, Bell GW, et al. (2009) Parkinson's disease patient-derived induced pluripotent stem cells free of viral reprogramming factors. Cell 136: 964-77. 31Dimos JT, Rodolfa KT, Niakan KK, Weisenthal LM, Mitsumoto H, et al. (2008) Induced Pluripotent Stem Cells Generated from Patients with ALS Can Be Differentiated into Motor Neurons. Science 321: 1218-21. 32 Roy N, Mahadevan MS, McLean M, Shutter G, Yaraghi Z, et al. (1995) The gene for neuronal apoptosis inhibitory protein is partially deleted in individuals with spinal muscular atrophy. Cell 80: 167-78. 33 Seidl R, Bajo M, Böhm K, LaCasse EC, MacKenzie AE, et al. (1999) Neuronal apoptosis inhibitory protein (NAIP)-like immunoreactivity in brains of adult patients with Down syndrome. J Neural Transm Suppl 57: 283-91. 34Christiea LA, Sua JH, Tua CH, Dicka MC, Zhoub J, et al. (2007) Differential regulation of inhibitors of apoptosis proteins in Alzheimer's disease brains. Neurobiol Dis 26: 165-73. 35Xiao D, Wang J, Hampton LL, Weber HC (2001) The human gastrin-releasing peptide receptor gene structure, its tissue expression and promoter. Gene 264: 95-103. 36Kamichi S, Wada E, Aoki S, Sekiguchi M, Kimura I, et al. (2005) Immunohistochemical localization of gastrin-releasing peptide receptor in the mouse brain. Brain Res 1032: 162-70. 37Tchieu J, Kuoy E, Chin MH, Trinh H, Patterson M, et al. (2010) Female human iPSCs retain an inactive X chromosome. Cell Stem Cell 7: 329-42. 38Roesler R, Luft T, Oliveira SH, Farias CB, Almeida VR, et al. (2006) Molecular mechanisms mediating gastrin-releasing peptide receptor modulation of memory consolidation in the hippocampus. Neuropharmacology 51: 350-7. 39 Lindsey JC, Lusher ME, Strathdee G, Brown R, Gilbertson RJ, et al. (2006) Epigenetic inactivation of MCJ (DNAJD1) in malignant paediatric brain tumours. Int J Cancer 118: 346-52. 40 Boettcher M, Kischkel F, Hoheisel JD (2010) High-definition DNA methylation profiles from breast and ovarian carcinoma cell lines with differing doxorubicin resistance. PLoS ONE 5: e11002. 41 Lister R, Pelizzola M, Dowen RH, Hawkins RD, Hon G, et al. (2009) Human DNA methylomes at base resolution show widespread epigenomic differences. Nature 462: 315-22. 42Maherali N, Sridharan R, Xie W, Utikal J, Eminli S, et al. (2007) Directly reprogrammed fibroblasts show global epigenetic remodeling and widespread tissue contribution. Cell Stem Cell 1: 55-70. 43 Yang J, Cai J, Zhang Y, Wang X, Li W, et al. (2010) Induced pluripotent stem cells can be used to model the genomic imprinting disorder Prader-Willi syndrome. J Biol Chem 285: 40303-11. 44 Hu BY, Weick JP, Yu J, Ma LX, Zhang XQ, et al. (2010) Neural differentiation of human induced pluripotent stem cells follows developmental principles but with variable potency. Proc Natl Acad Sci USA 107: 4335-40. 45Feng Q, Lu SJ, Klimanskaya I, Gomes I, Kim D, et al. 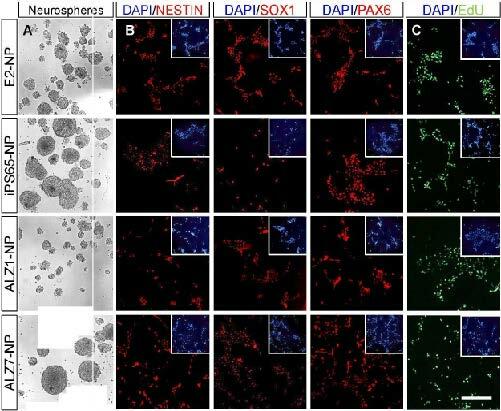 (2010) Hemangioblastic derivatives from human induced pluripotent stem cells exhibit limited expansion and early senescence. Stem Cells 28: 704-12. 46Kaichi S, Hasegawa K, Takaya T, Yokoo N, Mima T, et al. (2010) Cell line-dependent differentiation of induced pluripotent stem cells into cardiomyocytes in mice. Cardiovasc Res 88: 314-23. 47 Crews L, Masliah E (2010) Molecular mechanisms of neurodegeneration in Alzheimer's disease. Hum Mol Genet 19: R12-20. 48Jin ZB, Okamoto S, Osakada F, Homma K, Assawachananont J, et al. (2011) Modeling retinal degeneration using patient-specific induced pluripotent stem cells. PLoS ONE 6: e17084. 49 Wicklund L, Leão NR, Strömberg AM, Mousavi M, Hovatta O, et al. (2010) β-amyloid 1-42 oligomers impair function of human embryonic stem cell-derived forebrain cholinergic neurons. PLoS ONE 5: e15600. Figure 1: Preoperative spine MRI. (A) Sagittal lumbar T2 image showing extensive subarachnoid hemorrhage with lumbosacral flow void and S1-S2 lipoma; (B) T2 Axial view of large hematoma with significant compression of the lumbar dural sac; (C) T2 sagittal view of thoracic extension of the hematoma, with significant spinal cord compression at D4-D6; (D) Angiography of lumbosacral AVM responsible for hemorrhage prior to embolization. Figure S3: Differentially expressed genes between control and disease pluripotent lines. 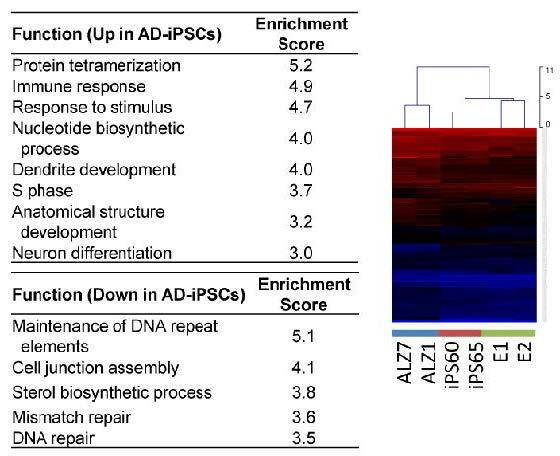 A) 335 genes were differentially expressed between AD-ipSCs vs. Co-iPSCs, and B) 160 genes between AD-iPSCs vs. hESCs. To determine overall biological functions, GO enrichment analysis was performed on genes that were up- or downregulated in a cell population. Functions with enrichment scores > 3 were considered significant. Heatmaps/dendograms were also generated for these two lists of genes, and surprisingly hESCs, Co-iPSCs and AD-iPSCs grouped separately from each other.